A two-year-old boy has been killed in a hit-and-run crash yesterday afternoon, which also left his six-year-old brother fighting for life. The siblings were mown down on MacDonald Road, in Stoke, Coventry, at 2pm. A black Ford Focus with a smashed windscreen and deployed airbags was abandoned in nearby Longfellow Road a short time later. A 22-year-old man and a 41-year-old woman have been arrested. The road remains closed while emergency services are at the scene and officers are speaking to witnesses. Tyre skid marks and debris could be seen within the police cordon. Four ambulances, two paramedic officers and a critical care car with a medic on board from the Air Ambulance Service were sent to the scene. A spokesperson for West Midlands Ambulance Service said: “Crews arrived to find two pedestrians, both young boys, who had been seriously injured following the collision with the car. “Unfortunately, shortly after arrival at hospital it became apparent nothing could be done to save one of the boys and he was confirmed deceased. “The second boy was taken to Birmingham Children’s Hospital and accompanied by the air ambulance crew who helped to administer specialist treatment en route. 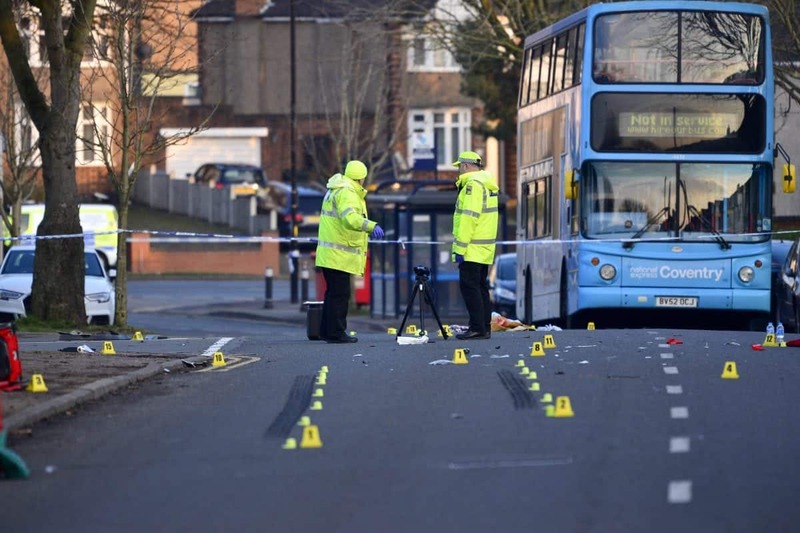 A spokesman from West Midlands Police said: “We were called to reports of a serious collision just after 2pm today near the Painted Lady pub on Longfellow Road, Coventry. Detective Sergeant Paul Hughes, from the force’s collision investigation unit, said: “We are still trying to establish how this tragic incident has happened and anyone who hasn’t yet spoken to an officer should call us on 101.